Henry Hopkins Sibley. Courtesy of the Library of Congress. Image available on the Internet and included in accordance with Title 17 U.S.C. Section 107. Map of Sibley's Campaign in Texas. Image available on the Internet and included in accordance with Title 17 U.S.C. Section 107. SIBLEY'S BRIGADE. On May 31, 1861, Henry Hopkins Sibley resigned his commission in the Second United States Dragoons and hurried to Richmond, where he persuaded Jefferson Davis to adopt a grandiose plan to capture New Mexico Territory and use it as a gateway for Confederate occupation of Colorado and California. He organized a brigade at San Antonio in the late summer and early fall of 1861. Col. James Reily, a seasoned diplomat with military experience, commanded the Fourth Regiment. Col. Thomas Green, a veteran of the battle of San Jacinto and the Mexican War, was placed in command of the Fifth Regiment, and Col. William Steele, like Sibley a veteran of the Second Dragoons, headed the Seventh Regiment. By Christmas 1861 the brigade had set up headquarters at Fort Bliss, where Col. John Robert Baylor's Second Regiment of Texas Mounted Rifles was incorporated into the brigade's ranks. 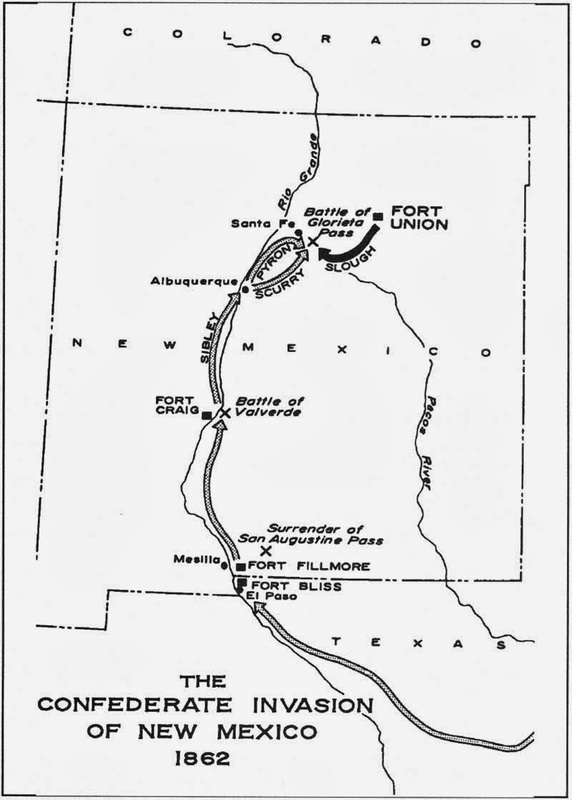 When the "Confederate Army of New Mexico" marched up the Rio Grande River and attempted to bypass the federal bastion of Fort Craig, the bloody battle of Valverde resulted-a defeat for the Union garrison. After occupying Albuquerque and raising the Stars and Bars over Santa Fe, the territorial capital, General Sibley ordered the brigade to move against Fort Union, a major federal supply depot for the Southwest. The advance guard of the brigade under Maj. Charles L. Pyron was defeated by Colorado "Pikes Peakers" in Apache Canyon, but a larger force under the command of Col. William R. Scurry drove the federals from the field on March 28 in the battle of Glorieta. The battle proved to be the "Gettysburg of the West," however, when the brigade lost its supplies at Johnson's Ranch in Apache Canyon to the Confederate rear. After skirmishes at Albuquerque and Peralta, the brigade took a disastrous route across the eastern slopes of the San Mateo Mountains while evacuating the territory. Col. William Steele, with a force of some 600 men, was left to guard the Mesilla valley, part of Confederate Arizona, but he too retreated into Texas at the approach of Gen. James H. Carleton's California Column. Almost a third of Sibley's more than 2,500 men were lost in New Mexico. Map of Sibley's Campaign in New Mexico. Image available on the Internet and included in accordance with Title 17 U.S.C. Section 107. After Sibley was called to Richmond to account for the New Mexico disaster, the brigade was commanded by Col. Green and participated in the recapture of Galveston on January 1, 1863 (see GALVESTON, BATTLE OF). After transfer to Louisiana, the brigade next saw action in the Acadian bayou country under Gen. Richard Taylor. After the Confederate defeat at the battle of Bisland on April 13 and 14, 1863, in which Col. Reily was killed, Sibley was court-martialed by Taylor and removed from command. In July part of the brigade commanded by Green attacked the federal garrison at Brashear City before moving east to assault Donaldsonville. Although temporarily ordered back to Texas in December 1863 to guard the Texas coast near Galveston, the brigade was countermarched to Louisiana to join Taylor in time to play a major role in the decisive battles of the Red River Campaign at Sabine Cross Roads near Mansfield on April 6, 1864, and at Pleasant Hill on April 9. At Blair's Landing on the Red River, Gen. Green was killed while leading an attack on a fleet of federal gunboats. Back in the Bayou Teche region, Col. William Polk Hardeman assumed command of the brigade. After brief duty at Valdalia, on the Mississippi River opposite Natchez, the brigade was ordered to Arkansas in the fall of 1864. Most of the men were in Houston in May 1865 under the command of Col. Henry C. McNeill when they surrendered as part of the Trans-Mississippi command. Martin Hardwick Hall, The Confederate Army of New Mexico (Austin: Presidial Press, 1978). Martin Hardwick Hall, Sibley's New Mexico Campaign (Austin: University of Texas Press, 1960). Theophilus Noel, Campaign from Santa Fe to the Mississippi (Shreveport, Louisiana, 1865; rpt., Houston: Stagecoach Press, 1961). Jerry D. Thompson, "From Valverde to Bisland: A Brief History of the Sibley Brigade," in Confederate History Symposium (Hillsboro, Texas, 1982). Jerry D. Thompson, Henry Hopkins Sibley: Confederate General of the West (Natchitoches, Louisiana: Northwestern State University Press, 1987). Handbook of Texas Online, Jerry Thompson, "SIBLEY'S BRIGADE," accessed April 21, 2019, http://www.tshaonline.org/handbook/online/articles/qks02.